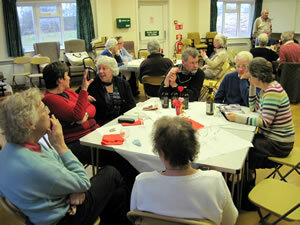 The annual Wincanton Lahnau Twinning Association lunch, held in the David Sharp Centre on Sunday 13th, was attended by 30-plus members and friends who enjoyed a lunch of Lasagne, Cottage Pie, Vegetables and French bread, followed by a choice of various desserts. All of this for the small sum of £4 per head! 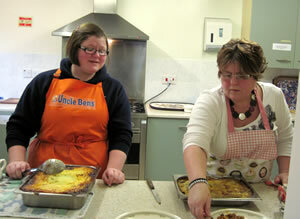 The food was prepared and cooked by Elaine, Yvonne, and Zoe Rodgers and it all tasted delicious. We also held a raffle and had lots of prizes. All of these events, small or large, go towards our continuing fund raising to keep the Association running. This year it will be our turn to visit Germany in our Twin town, Lahnau. It will be our 20th anniversary visit so something of a special one. We go on 28th May and return on 4th June. The cost of the trip is £150.00 and also you must become a paid up member of the Association and be prepared to host the following year. If you would like more details, please contact myself, Mrs Gill D'Arcy, Secretary, on 01936 33160 or Mr Phil Rodgers, Chairman, on 01963 32508. Watch out for more of our fundraising events throughout the year. I am wishing all friends of The WLTA good times and I'm looking forward - as all members of the Lahnau Twinning Association are doing - to seeing you end of may in Lahnau.